Birthday Bounty (262/365) – Annoyingly Boring? A couple of these guys aren’t new, but the Sesame Street population at our place boomed with the recent birthday. And she’s loving every minute of it. Hey, it’s my furry old pal Grover! She’s the sweetest! Happy Birthday Sweetheart! Goodness I cannot believe how big she is getting..
That show hasn’t been the same since they killed off Mr. Hooper. And why wouldn’t she be? 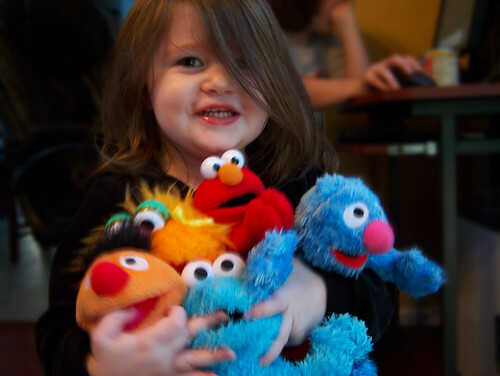 That is a veritable Muppet bounty! looks like cookie monster is trying to eat her fingers. I probably watched sesame street until I was in junior high school. I loved all the characters. I still have fond memories.